LinkedIn Rolls Out Matched Audiences: LinkedIn introduced Matched Audiences, “a set of targeting capabilities that give you the unique ability to combine LinkedIn’s powerful professional data with your own first-party data.” With Matched Audiences, members can engage key accounts, prospects, and audiences “that matter most to [their] business with three new capabilities.” These capabilities include Website Retargeting, which allows businesses to market to LinkedIn members who visited their website with always-on campaigns. LinkedIn also rolled out the ability to engage prospects from your list of contacts with Contact Targeting and reach decision-makers and influencers at companies you’re targeting with Account Targeting. Facebook Allows Content Owners to Claim Ad Revenues From Freebooted Videos: Facebook updated the Rights Manager to include a new option that allows content owners to “claim ad earnings” generated from a piece of content that other users have taken from them and uploaded elsewhere. For example, if a freebooted video happens to be served a new mid-roll ad break that Facebook is currently testing, then the resulting revenue could automatically be sent to the content’s rightful owner instead of the infringing user who uploaded it. Facebook now allows content owners to claim ad earnings from freebooted videos. Facebook Brings Messenger Lite to More Countries: Facebook announced that Messenger Lite is now available to more countries around the world including Germany, Colombia, Italy, Vietnam, Algeria, Morocco, Nigeria, Peru, Turkey, Japan, Taiwan, and the Netherlands. 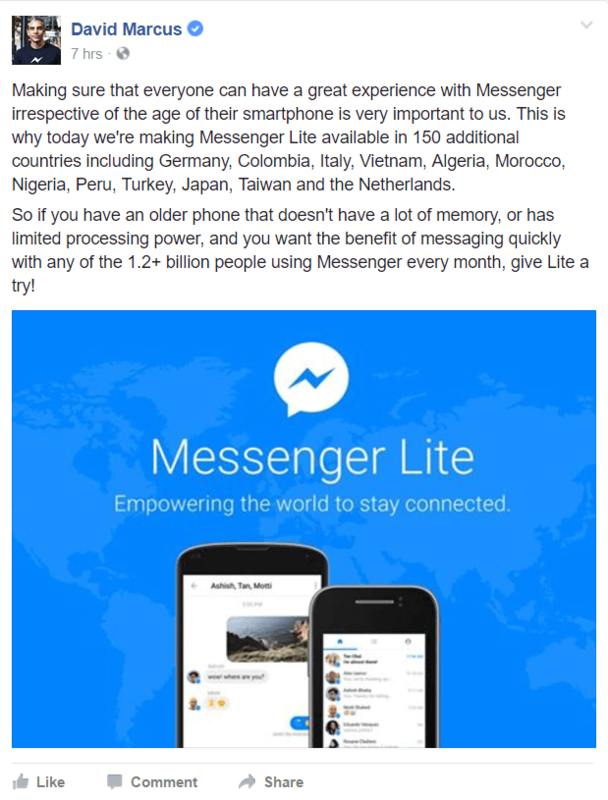 Facebook highlights the benefits of using Messenger Lite on older phones with limited processing power, but it’s also helpful in areas with spotty or unreliable Internet connections. Facebook Messenger Lite is now available in more countries around the world. Pinterest Retires the Like Button: On its company blog, Pinterest announced plans to retire the Like button “in the coming weeks.” The company states that confusion about the differences between the Save button and the Like button and research showing that Pinterest is “easier to understand” without the Like button led to this decision. It’s speculated that this minor update is a way for Pinterest to “separate itself from other photo-heavy social platforms where ‘Like’ buttons are prominent, primarily Facebook and Instagram” and establish itself as a visual discovery tool. In this week’s show from Friday, April 28, 2017, Michael Stelzner and guests discuss the top news in social media. Topics include Facebook Live Camera Effects (6:50), Facebook Video Cover Images (25:24), Pinterest Desktop Visual Search (31:59), and LinkedIn Retargeting (40:41). Subscribe to future shows here. Previously, branded geofilters could only be purchased through Snapchat’s self-service Buy tool. With this update, vendors can now “help brands buy bigger ad packages that include both formats and automatically manage the targeting of geofilters to make sure they run at specific locations and times” and creative firms can provide templates to help brands design custom messaging for their geofilters. Facebook Expands Dynamic Ads to Target Airline Customers Globally: Facebook extended Dynamic Ads for Travel to include flights globally across Facebook, Instagram, and Facebook’s Audience Network ad network. Marketing Land reports that these new flight ads are similar to the industry-specific retargeted ads that Facebook rolled out for hotel inventory almost a year ago. With Facebook’s new Dynamic Ads for Travel for Flights, marketers can retarget potential air travelers with ads featuring flight information such as dates, airport names, or links to an airline’s site or mobile app. Pinterest Improves Chrome Extension for Visual Search: Pinterest announced “an update to its browser button for Google’s Chrome browser that should make it easier to save interesting content that users find on websites.” Using a new technology called “instant image feature detection,” Pinterest’s new Chrome extension will “automatically highlight any interesting thing that’s visible in the current [browser] window… and then show you pins that are visually similar.” This update surfaces “much better results” and “is so much more useful” when searching for similar items on Google Chrome. Instagram Reaches 700 Million Users Worldwide: Instagram shared that its “community has grown to more than 700 million” worldwide. It also announced that the “the last 100 million… joined faster than ever,” which refers to Instagram’s accelerated growth from 600 million users as reported only four months ago. TechCrunch reports that it previously took Instagram six months to go from 500 million in June 2016 to 600 million by December 2016. It credits the addition of new features such as “Stories, web signup, and better onboarding on low-end Android phones” for the platform’s rapid user growth and retention over the past two years. 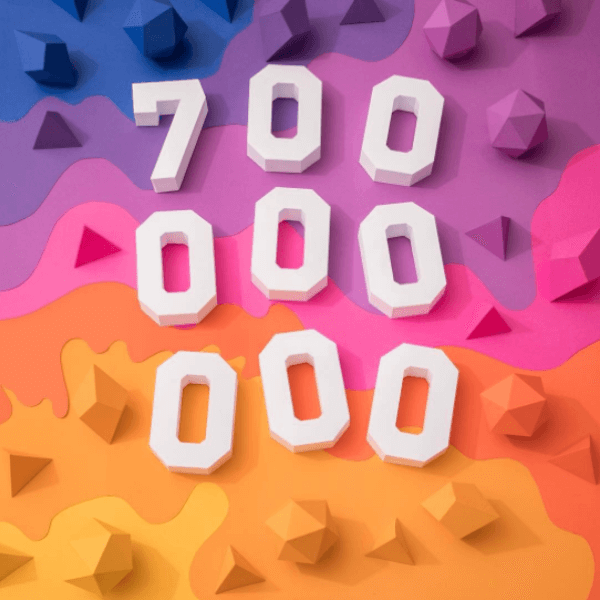 Instagram reaches 700 million users worldwide. 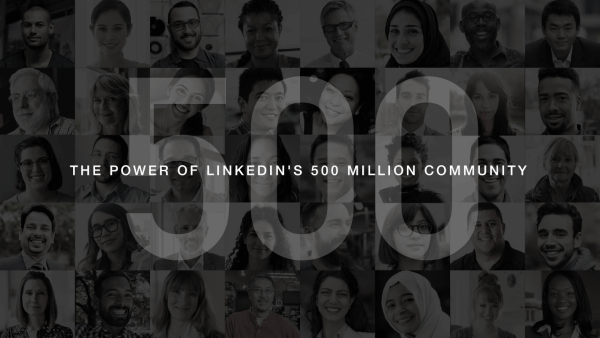 LinkedIn Reaches 500 Million Members Worldwide: LinkedIn reached an important milestone of “half a billion members in 200 countries connecting and engaging with one another” on its platform. LinkedIn also provided insights on the “top 5 most connected” industries, countries, and jobs within the LinkedIn community and the average number of contacts, companies, and opportunities each connection in your personal LinkedIn network reaches. LinkedIn reached an important milestone of having half a billion members in 200 countries connecting and engaging with one another on its platform. Twitter Adds 9 Million New Monthly Average Users in Q1 2017: In its Q1 2017 Earnings, Twitter shares that it has averaged 9 million added monthly users this past quarter. It also streamed over 800 hours of live premium video content and added 45 million unique viewers this past quarter as well. Yet Twitter’s overall revenue declined year over year for the first time and advertising revenue across all ad formats shrank for the second straight quarter in a row. The report states that live video has become Twitter’s “single largest revenue-generating ad format” in Q1 2017, while promoted tweets and direct-response ad formats declined year over year. 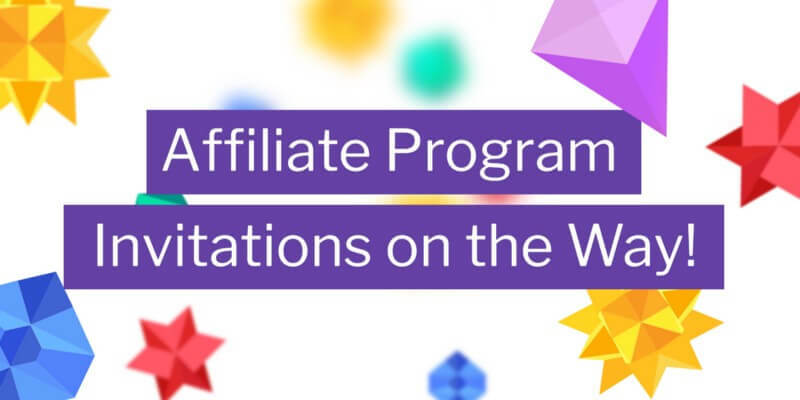 Twitch Launches New Affiliate Program for Qualifying Non-Partner Channels: Twitch launched a new affiliate program “to help streamers who have been working hard to grow their stream, but haven’t reached Partner status.” The new affiliate program allows qualified streamers to start earning on their channels and will give them access to additional tools “in the future.” To qualify, non-partnered streamers must have at least 500 total minutes broadcast in the last 30 days, 7 unique broadcast days in the last 30 days, an average of 3 concurrent viewers or more over the last 30 days, and at least 50 followers. Twitch opens a new affiliate program for qualifying non-partner channels. YouTube Expands YouTube Kids App to Select Smart TVs: YouTube announced that the YouTube Kids app, which was previously only available on mobile, can now be enjoyed on “select smart TVs” in the 26 countries where the app is currently in operation. YouTube notes that access to the YouTube Kids app within each country is also “dependent on the individual television manufacturer.” TechCrunch reports that several complaints have been filed with the FTC about advertising and influencers on YouTube and YouTube Kids being used to market to minors. YouTube responded by rolling out an ad-free subscription option for YouTube Kids that removed paid ads on the network but not undisclosed influencer videos. Facebook Tests Video Cover Images for Pages: Facebook is testing the ability to upload videos as cover images on pages. Facebook confirms that it’s “always looking for ways to help businesses create more engaging experiences and drive more rich experiences for their audiences” but didn’t share any further details regarding plans to expand this feature more broadly. Facebook Tests New Related Articles Feature in News Feed: Facebook is testing a new Related Articles feature that surfaces similar news items that might appear before you read an article in the news feed and provides “additional perspectives and information including articles by third-party fact-checkers.” Facebook initially added Related Articles to the news feed in 2013 “to show people additional articles similar to ones they had just read.” This new Related Articles feature would appear before users click on the stories in their news feeds. 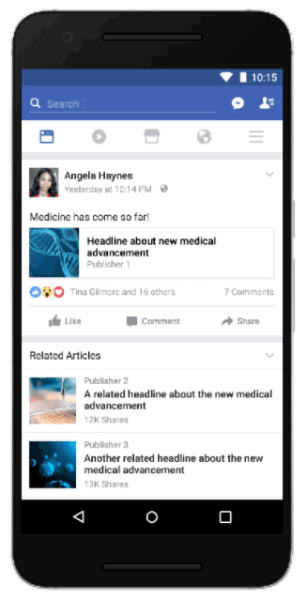 Facebook is testing a new Related Articles feature. The 2017 Influencer Marketer Report: A new survey from micro-influencer marketing platform Hashoff reveals nearly all respondents (92%) say that Instagram is the “#1 platform” for influencer work, citing community and opportunities to connect with brands as the driving factor for this choice. Facebook was chosen as #1 by nearly 3%, which means that Instagram and Facebook together dominate influencer marketing as the focus platform for 95% of influencers at the expense of other platforms. Twitter, Snapchat, and others were cited by “only 2.4% of influencers combined,” and this figure is predicted to decline even further over the coming year. Solving the WBE Digital Disconnect: A new report from Slice Communications, Cogberry Creative, and Creatives on Call explores the reason why women’s business enterprises (WBEs) are “missing out on market share despite a climate of access in the supplier inclusion industry” and examines the “digital disconnect” between the way WBEs are using digital marketing and social media and how buyers are making purchasing decisions. The study reveals that out of almost 900 WBEs surveyed across the U.S., approximately 64% don’t maintain a current or active social media presence. In addition, 45% of the WBEs surveyed have a website that doesn’t adequately communicate the products and services they offer. What do you think of LinkedIn’s new retargeting tool, Matched Audiences? Have you updated your content management preferences in Facebook Rights Manager? Please share your comments below. 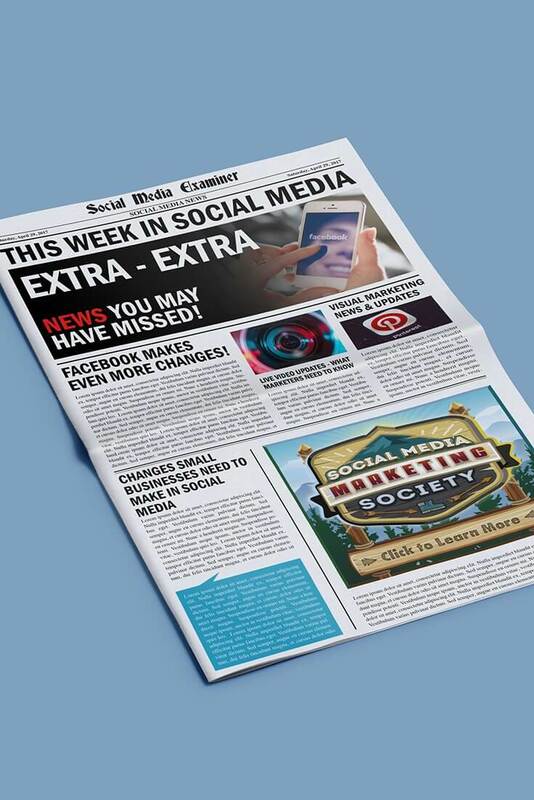 New LinkedIn Remarketing Capabilities and other social media news for Apr. 29, 2017.